Every bride has a unique look on her wedding day that sets her apart from everyone else. However, some looks are more unique than others, and those are the ones that always stand out in my memory. To be the best wedding photographer, it is essential to get a shot of the bride-to-be looking absolutely beautiful and flawless in every way. It is not very often that a woman sees a photo of herself that she loves, which is why it is our job to make that happen. This look will always be one of my favourites out of all of the weddings we have shot. The theme of the wedding was vintage glamour, which the bride executed perfectly with her look. This glamorous sheath gown was detailed with both sheer chiffon fabric on the sleeves and elegant beading on the bodice and skirt. 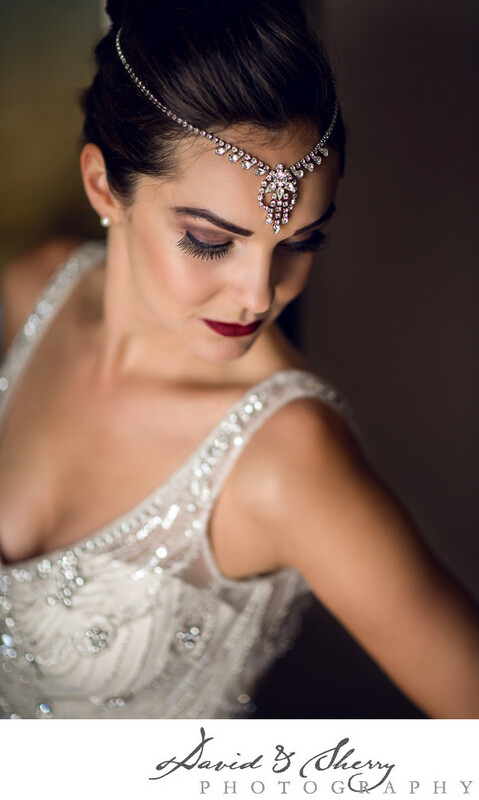 The 1920’s style headpiece compliments the dress perfectly with its diamond embellishments. This kind of headpiece is rare to see nowadays, but it always gives a unique and classy look that takes you back in time. Finally, the whole ensemble is tied together with the bride’s flawless makeup. Long, thick eyelashes, a smokey eye, and classic red lips really pulled the look together and gave it that vintage feel. Location: 81 Charleston Sideroad, Caledon, ON L7K 0R9.